This coming Sunday, November 27, 2011, Harrisburg Area Roller Derby will be holding an end of the year fan appreciation party at the Harrisburg Midtown Arts Center (HMAC.) The event kicks off at 6 pm, including a silent auction and Derby Girl Karaoke. Cost is $8, unless you have a bout program, then it’s only $5. Ubar Grotto has been invited to set up a table at this event to share information on who we are what we do (although, we are pretty sure that very few of us could easily define what makes Ubar so awesome.) Representatives of Ubar will be on hand with the Ubar display, free wristbands, information about the organization, and of course the Ubaritar! Make sure to stop by and check us out! But wait, there’s more! Our Monarch, Pro. Seth Anthony, has donated an out-of-production, Fez-o-rama Skull and Crossbones fez for the silent auction at this event on behalf of Ubar Grotto. 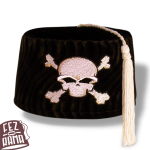 This fez is low profile and features a familiar jolly roger motif. The fez is an XL, measuring 23.5 inches around. Many have already expressed interest in this item and we hope that it raises big money for HARD. So, once you’ve sliced, diced, shopped, and dropped, why not head to HMAC to close out the Thanksgiving weekend in style? We hope to see you there!